The international financial system has come under strain several times in recent years, and analysis has shown that most crises originated from the risks built into cross-border exposures. 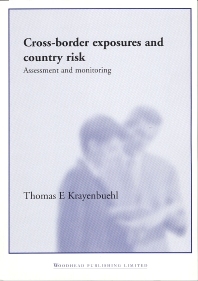 Assessment and monitoring of cross-border exposures and country risk are essential activities for international lending agencies such as government bodies, banks, multinational corporations and other investors. Inadequate risk management could have a destabilising effect on both lender and borrower and could result in a major international financial crisis. This completely revised edition of Thomas E Krayenbuehl's classic handbook clearly shows how the various players can quantify and manage the complex factors involved in order to minimise the risk and avoid potentially catastrophic consequences. It provides both a rigorous analysis of the current situation and a guide to meeting the challenges of the future. Overview; The need for capital; Risks in cross-border exposures and their assessment; Monitoring of cross-border exposures and hedging of country risk; Responsibilities; Conclusions. After graduating as a Doctor of Law in 1961, Thomas E Krayenbuehl began a career that has involved him in banking and financial control and management in the USA, Switzerland and Germany. In 1998 he retired from Union Bank of Switzerland, now UBS AG. At UBS his responsibilities were always associated with business development and risk management in the developing world. He is now an independent consultant working for, among others, the International Finance Corporation in Washington and the Swiss Government on projects in the developing world.